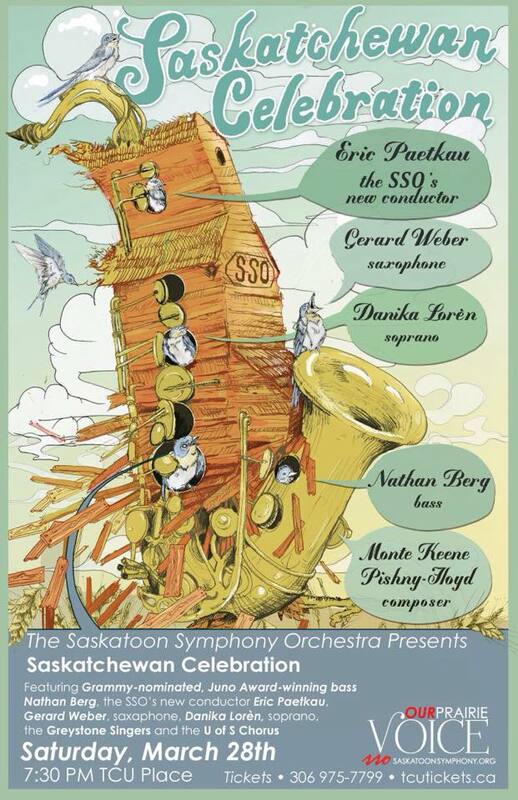 I had the fortunate opportunity to solo with two special musical groups in Saskatchewan this past Fall and Spring – the Saskatoon Symphony Orchestra and the Regina Symphony Orchestra. My solo appearance with these groups was the result of winning the Saskatchewan Music Festival Association Shurniak Concerto Competition in February 2013. I can tell you that these performances brought one of my biggest dreams to a reality: performing as a saxophone soloist with a symphony orchestra. Ever since I first saw the Saskatoon Symphony Orchestra perform, I’ve always wanted to stand on stage as a soloist with a symphony orchestra. I was motivated further by the terrific repertoire of saxophone concertos that I studied in my undergraduate degree. My debut with a symphony orchestra actually happened in Fall 2013 while I was in Florida for the first year of my Master’s degree. I won the University of Florida Concerto Competition and had the honour of performing the first movement of Lars-Erik Larsson’s Concerto for Saxophone and String Orchestra with the UF Orchestra. I’ve never felt so comfortable as a performer playing with a symphony orchestra. The piece I performed was Paul Creston’s Concerto for Saxophone and Orchestra, Op. 26, written in 1941. This piece is usually performed nowadays as an arrangement for saxophone and wind band, but I had the fortunate opportunity to play Creston’s original version for symphony orchestra. Creston’s rich sense of harmony and scoring makes perfect sense with symphony orchestra, especially in the gorgeous second movement. If you’ve never heard this piece before, go listen to it! It’s one of my favourite saxophone works to perform. Both the Regina and the Saskatoon symphony orchestras did a tremendous job in navigating a piece that they were not familiar with in only a few rehearsals. We also worked with two brilliant guest conductors for those concerts: Maestro Boguslaw Dawidow with the RSO, and Mastro Eric Paetkau with the SSO (Paetkau was recently appointed as the new director of the SSO). It ended up being a big challenge for everyone, working with a new piece with guest conductors. Dawidow and Paetkau, however, were true professionals and made me feel right at home with the orchestras. The best part of my experience was being able to share my professional orchestral debut and one of my favourite pieces with my friends and family back home. The RSO, the SSO, and the SFMA recognize that we have amazing talent in this province and are providing opportunities to showcase these artists and kickstart their professional careers. I can’t wait to see what Paetkau has in store for Saskatoon this upcoming season and what Regina’s newly appointed director, Gordon Gerrard will do with the RSO next season. The Music Festival Association interviewed me on my experience with these two performances – visit http://www.smfa.ca/media.php#archives and click to download the March Festival Focus newsletter to read the write-up on my experience performing with these orchestras.